The chemical aroma of fresh paint and burning plastic fills one’s nostrils inside the cavernous factory alongside one of Johannesburg’s busiest highways. At tables scattered across a sprawling floor, teams of artists scrawl designs on sheets of paper. Some hack and shape chunks of recycled plastic, while others frantically paint it in a swirl of colors. Supervising it all is one of South Africa’s most famous football supporters, Alfred Baloyi. “You can call me ‘Lux,’ he says, extending a calloused, paint-stained hand. “All my friends do. It’s because when I was a child I loved Lux soap. I even did eat some once! Then people started calling me ‘Lux,’” he adds. More than 30 years ago, Baloyi invented what’s now an iconic symbol of South African football – the ‘makarapa’, or ‘hard hat’, adorned with all kinds of decorations. The embellishments commonly include images of favorite players, former president Nelson Mandela, current politicians and team flags and colors. For the World Cup – Africa’s first – Baloyi and his employees are making makarapas to suit fans of most of the 32 teams. Baloyi wears a makarapa on top of which is the carved likeness of former South African football legend Lucas Radebe, wearing his team’s green and gold and holding two vuvuzela trumpets. Underneath Radebe’s image is a replica of Johannesburg’s Soccer City stadium, where the opening game and World Cup final are to be played. 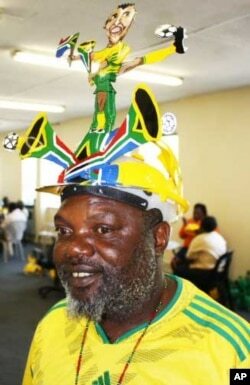 A Zulu warrior, waving South Africa flags, is perched atop another of the hats. Others bear likenesses of the best international football players, like Argentina’s Lionel Messi. 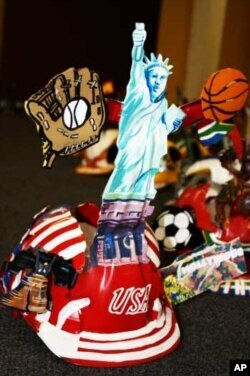 Some are geared towards United States supporters, painted in stars and stripes or decorated with a plastic Statue of Liberty, baseball mitt or basketball. There’s a design for French supporters, their Les Bleus team’s cockerel symbol preening on top of a makarapa, and another for British fans, painted with the traditional blood red St. George’s Cross. Baloyi says his creations will retail for the equivalent of about US$ 30 each, and that judging from the orders he’s received so far, the makarapa’s going to make a “huge impact” at the football extravaganza. “The way I invented the makarapa is almost as weird as I am,” Baloyi says. In early 1979, he was employed as a municipal worker in South Africa’s capital, Pretoria. The manual labor required a hard hat. Later that year, Baloyi attended a match in Soweto between his favorite team, Kaizer Chiefs, and another leading team, Moroka Swallows. Violence broke out between rival supporters. “When I get into the stadium, I saw somebody throwing the bottle, (and it) hit on somebody’s head. I was scared; I think about my makarapa. Next game, I wear my makarapa…. to protect my head,” Baloyi explains. 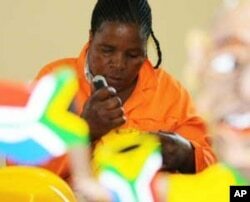 But, shortly before the match, he decided to paint his hat in orange and black, the colors of Kaizer Chiefs. It was an innovation that “transformed” Baloyi’s life, and initially caused an “uproar” wherever he wore his makarapa across South Africa. “The people, they liked it. (They were saying) ‘Hey, give us that makarapa.’ Then I started to sell them…. Now, the makarapa is part of South African culture,” Baloyi says, shaking his head as if he still can’t believe how protective headgear resulted in a thriving business. Already, the makarapa is the subject of an international media frenzy. Baloyi says he’s getting so many requests for interviews across the globe that’s he’s beginning to decline them. Baloyi has made plenty of US supporters coming to South Africa for the world cup. “If I had to be interviewed so much, I would never get any work done!” he says, raising his voice. But the foreign reporters soon want their own decorated hard hats. Baloyi, just like his invention, has come to epitomize the chaotic, colorful nature of South African football. “If I go home (to my village in Limpopo province), they call me ‘makarapa’ because they know we wear the makarapa here (in Johannesburg),” he says, beaming with pride. But it’s also a term of respect for someone from his tiny village who’s “made it big” in the big city of Johannesburg. “The makarapa is somebody who’s got money,” Baloyi explains. He hopes to partner with a large international company to take his invention global. Focusing his attention on the actual World Cup, Baloyi declares confidently that Bafana Bafana – as the South African football team is known – will do “well” at the tournament, even though many pundits have written them off. “Every country who host (the World Cup), they qualify until the final. We can win that trophy. We can hold that trophy!” he says, raising his arms aloft in premature triumph. While winning the World Cup may be a long shot for South Africa, for Alfred ‘Lux’ Baloyi, the competition represents another personal victory, as his business expands beyond what he ever imagined.